We all know just how important emergency funds are to protect yourself against any future financial headwinds that life may throw at you. After spending most of my working life as a self employed person though, I honestly feel that emergency funds should be a huge consideration in future financial planning. Perhaps even more so than they are for employed people. I say this because of the increased risk that you’ll need to dip into it should you fall ill or if work should dry up for a while. When you’re employed then your main focus for building an emergency fund would likely be for unexpected expenses or a job loss. If you fall ill for a short time, there is the safety net of sick pay from your employer for the short or even the long term. Even if the sick pay from your job isn’t as much as you would normally receive, at least you have something in the short term. When you are self employed though, an illness – whether short term or sustained – could quite literally wipe your income out overnight depending on how reliant your business is upon your ability to work. Then we have the point about work drying up. If you’re employed, at least there is a chance of some kind of redundancy pay should you lose your job. No such luck if your self employed income dries up. Yes, there are insurance policies – accident, sickness and unemployment – that you can take out to pay a set monthly or one-off amount in the event of injury or illness, but these often require you to be ill or injured for a certain length of time before they will pay out and even when they do pay out, these policies have different criteria as to how much they will pay as a percentage of your income. The policy I had for example only paid out up to 50% of my monthly income and that was 50% of my net profit figure as a pose to my gross profit. Something to watch out for if you go for this type of insurance, you can contact an ASU advisor from this page. The first time I had to make a claim on one of these policies this information all came as quite a shock to me, not so much the deferred payout period but more the 50% of your income part. I was only young at the time and I hadn’t really read the fine print. When I took out my ASU policy I had to state how much I wanted to be insured for. As the amount I wanted to be insured for increased, so did the premium payable. I assumed that I would automatically be insured for the amount stated on the policy but when it came to claiming it turned out that – as I’ve mentioned already – I was only entitled to 50% of my net profit, which hit me quite hard at the time as I hadn’t planned for it. It also meant that I’d been paying a higher premium for my insurance each month than I really needed to, I was over-insured. So you can see how important it is to have a healthy emergency fund as a self employed person. I know some people who have fallen into the trap of not having an emergency fund because they are self employed and feel that they don’t have to worry about losing their job. With the sometimes unstable nature of self employment and the factors we’ve already mentioned though, I’d say that this is quite dangerous reasoning. 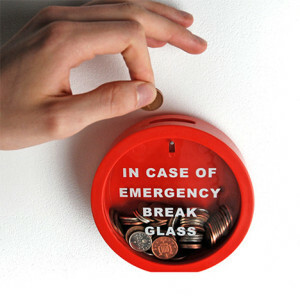 An emergency fund is just as important, if not more important for the self employed. So if you don’t have one already, be sure to start building your emergency fund today. I’m hoping to become self employed (freelancing or opening a business) soon, so this is so helpful! I’d ideally like to save up about 3 months of living expenses, but I didn’t even think about insurance! Great post! Thanks Michelle. It’s definitely worth looking into insurance but it can be costly and sometimes it can make more sense to just add that cash to your emergency fund if you can trust yourself not to dip into it. Whatever you think works out best for you really. This is significant considering so many self employed people are entrepreneurial types that often think their savvy ways will be able to get out of any emergency, but you should can’t roll those dice. Especially if that emergency specifically applies to your income streams. That’s so true Krista. We tend to think we’re invincible at times but it makes sense to have a healthy chunk in reserve considering the unpredictable nature of our work. I completely agree. The self employed should have a BIGGER emergency fund- so much more unpredictability. Great point about the fact that those who are self-employed have even more need for an emergency fund! I can see how it might be easy to initially think you don’t need it, but all we have to do is think back a few years to when time were really tough for many who are self-employed and we will know that’s not the case! You make a good point Dee. It’s easy to forget the past and start spending during the good times which isn’t a problem as long as you have enough in reserve. I think it’s important for everyone to have an emergency fund, but it is certainly that much more crucial for anyone who is self employed! One of the benefits of working for someone else is that you have a guaranteed paycheck on a certain day of the week. You don’t have that security as someone who has their own business or who is a freelancer. I would want even more money in my e-fund if I was self-employed, because you don’t have to have everything dry up to be in trouble – even a dip in workload or sales could put your finances in jeopardy. Couldn’t agree more Laura. I’ve always managed to get by during the tough times but having an emergency fund would have made things a lot easier. Adam, great piece. Having money put aside is really imperative for us self-employeds. Disability income insurance can not be relied upon especially with the usual long elimination periods (wait time before payments kick in). I have had a policy for decades and never used it and hope I never have to cause that means big problems for me. As for savings our society here in America just does not encourage thrift and being conservative so this sets the stage for some real exposure to financial hardship. Hope your message resonates with your readers as this is a most important and vital consideration.